Intuit this week previewed a new version of Mint—its web-based personal finance manager—one designed for small-business owners who want help untangling personal and business finances. The new Mint Home & Business (like Mint) will download online banking transactions and provide tools to automate categorization of expenses and income, and to divide a single expenditure between personal and business accounts. Unfortunately, it doesn't provide a full suite of small business finance tools (for example, there's no invoicing), so you'll have to decide whether the tools it offers are worth the hassle of having to manage business finances on more than one service. Mint Home & Business isn’t yet available—Intuit officials say it will be "soon," but haven't shared whether it will be a free and marketing-supported (like the current Mint personal finance manager), or whether fees will be involved. The service was among the newest products on display at an event marking Intuit’s 30 years in finance software. TurboTax CPA Select is a new Intuit site for people who want to work on their taxes with an accountant. Also showcased at the event at Intuit’s Mountain View campus was the newly launched TurboTax CPA Select—a web site where businesses or consumers can search for a certified public accountant to do their taxes. Right now the service has some 60 CPAs, with information on their background and where they practice, as well as user reviews with star ratings. Once you choose a CPA, you provide tax information and docs to them via the site; right now, you (and the accountant) don’t have to use TurboTax, but that may be a requirement going forward. You pay Intuit, which will pass along 75 percent of the fee to the CPA. Intuit says customers will get a good deal because it has pre-negotiated fees that are 30 percent below industry averages (based on the forms required for your return). 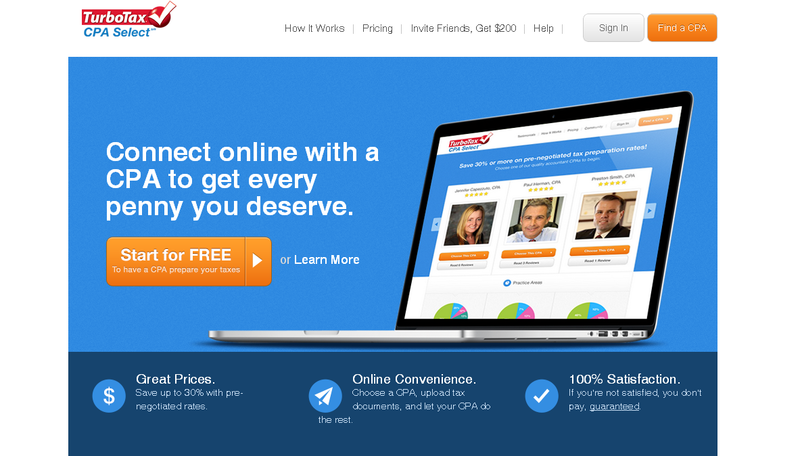 Why would CPAs work with Intuit for discounted fees? Because they would presumably save on marketing costs, Intuit says. In addition to booths for these and a couple of dozen other apps and services, the building where Intuit held the event also had a little nook containing the kitchen table where--according to Silicon Valley lore--Intuit founder Scott Cook came up with the idea of personal finance software after watching his wife struggle to balance her checkbook. As you can see below, the table is still in pretty good shape.